Arizona, took a trip to Sweden, visiting the remaining members of their family, three brothers, a sister and their families. Emma stayed on in the house on the farm by herself except for an occasional visit with members of her family in Vancouver. She passed away October 3, 1966. Charlie and Emma are buried at the Municipal Cemetery, Erickson. There were ten children in the family and the first seven were born in their Hilltop home with Mrs. Peter Johnson as midwife. The three eldest children started school at Hilltop and also Erickson. Hulda, born July 2, 1909, attended Hilltop and Erickson school, left Erickson at the age of 18 and worked in Winnipeg for sometime. Later she worked at Minaki during the summer and the winter months at Winnipeg Winter Club. 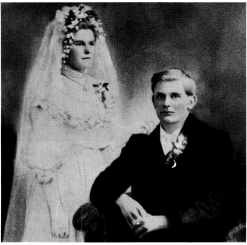 In 1943, Hulda married Holger Hanson who was in the R.C.A.F. In 1968, they moved to Port Coquitlam, B.C. Hulda passed away August 26, 1977. Holger and Hulda had a son and daughter. Leslie was born in 1944, and married and their children are Kathy, Michael and Mathew. Karin was born in 1947. Eva, born November 4, 1910, attended Hilltop school. In 1929, she attended business College in Winnipeg and later worked for a Chartered Accountant Firm. In 1939, she married Blair D. Hay of Winnipeg and became widowed in 1972. Blair and Eva had two children; Carol born 1942, married Adrain MacFarlane and they have two children Krista and Andrew. Donald, born 1946, married Elayne McComb and they have two children, Stephen and Tyler. Charlie and Emma Hill - 1907.
originally from Wawanesa, Manitoba. Edwin passed away June 21, 1980, and Alice on May 28, 1982. Annie, born September 30, 1914, attended school at Erickson. She worked at Clement family at Clear Lake and later for Doner's Store at Clear Lake. In 1938, Annie won the Miss Clear Lake Beauty Contest. In 1941, she married Arthur Haralson. (refer to Haralson, Arthur and Annie). Mabel, born March 28, 1916, attended Erickson school. She left the Erickson district at 19 years of age and worked at the Winnipeg Winter Club and Minaki. In 1942, Mabel married Percy McKenzie of Winnipeg. They lived in Winnipeg, then Edmonton and came back to Manitoba, where they rented the Hill farm, then pur­ chased a farm southwest of Erickson. In 1960, they sold the farm and moved to North Vancouver. Percy passed away in February, 1980. Percy and Mabel had three daughters; Tannis, a twin, was born in 1947, married Pat Sommerville and their children are Robert and Matthew. Terrise, a twin, was born in 1947. She was an invalid from birth and in 1957, she passed away and is buried at the Municipal Cemetery, Erickson. Lynne, born December, 1955, at the Erickson Medical Nursing Unit. Ernest, born January 29, 1918. (refer to Hill, Ernest and Stella). Edith, born February 10, 1921, attended Erickson school. In 1940, she left home to work at Minaki, On­ tario, then in 1946, she moved to Victoria, B.C. and later to Vancouver where she married Joe Holdsworth. They have a son, James, born in 1957. The family reside in Port Coquitlam, B.C. Charlie Hill Family. Back Row, Left to Right: Hulda, Annie, Edwin, Edith. 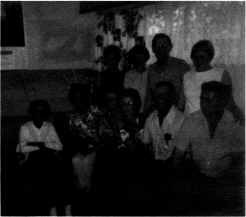 Front Row: Elvera, Selma, Mabel, Eva, Ernest and Kenneth.